Air Force Cadet 1st Class Jeremiah Baxter had the uneasy feeling of looking up and watching Ace, one of the Air Force Academy’s performance falcons, fly into the Louisiana sky rather than toward the lure the cadet falconer was holding on the field at the Independence Bowl. Ace was scheduled to perform at Air Force’s bowl game against Georgia Tech Dec. 15 at Independence Stadium in Shreveport, La. Ace, however, had other plans. So what happens when one of the falcons flies away and how did the academy find him? It’s not like when your dog runs down the street and you call his name and hold out a treat. Or is it? We contacted John Van Winkle, assistant officer in charge of cadet falconry, to figure out why Ace flew away and how the academy found him in a Shreveport parking garage before the game even ended. 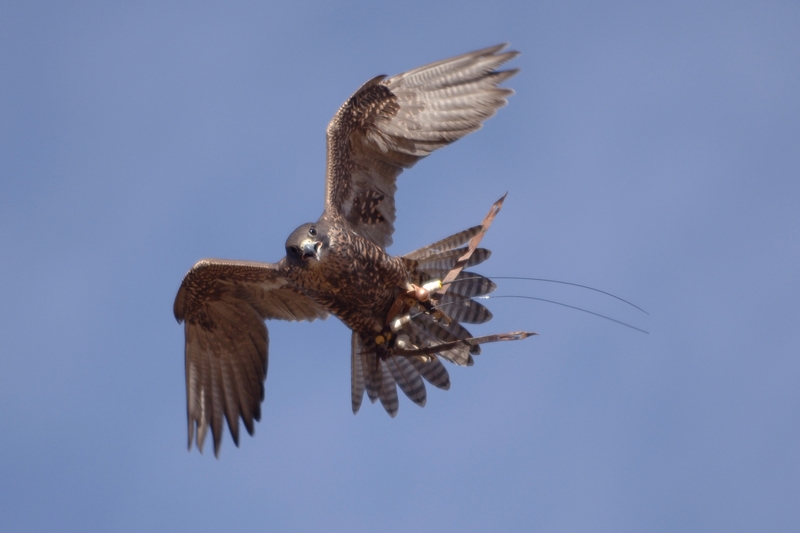 “The falcon in question was Ace, a black gyr/saker hybrid who’s one of our top flying performers. And he proved the “flying” portion of his job description by flying off to check out downtown Shreveport. Can’t blame him — one of the nice parts about away games and especially bowl games is checking out the local area. “Ace flew off because we tried to fly him when he was too heavy — about 1.5 to 2 ounces over his target weight. Since the falcons perform for their dinner, a heavy bird is a happy bird who is not focused on catching the lure. So Ace went and enjoyed a little bit of the local area, and in doing so provided a little different flavor of entertainment that what we were expecting.